35 miles of equestrian trails ranging from wooded and hilly to flat and grassy trails along the woods, to sandy river side trails. Large horse campground, no electric. Open 3 Man Sorting: 1st Hillary White, Mattoon , Lisa Forcia & Rhonda Brown, 2nd place Bob Matthews, Stewardson, Marshall Parkinson, Russell Snow, 3rd Hillary White, Bob Matthews, Rhonda Brown. 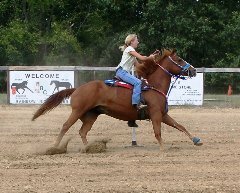 May events are posted on facebook and a calendar at www.coyotecreektack.com or call 217-844-2161. Free entertainment for spectators, new riders welcome. On, Saturday, April 27, Coyote Creek Stables Inc had the largest ranch sorting show in the last 8 years. Results are as follows. We had a great turnout, one of the best sorting shows ever at Coyote Creek. It was so sunny and warm we had the big North arena doors open! The outdoor arena was in perfect condition and most riders warmed up outside. Riders came from hours away including Kentucky and Chicago area. Ladies: 3 teams, 1st Shelly Custer & Michelle ? Coyote Creek has events 4 out of the next 5 weekends. Check out our events tab on the Coyote Creek Tack & Stables page. HORSE RIDING EVENT DATES, details and show bills are in the events tab on facebook. Horse Shows will be starting soon! Great turnout yesterday. Congratulations to Tony Brown who placed first second third and fifth in the open class! Only two more shows left this year! The third horse show of the summer season was held Sept 29 with a great crowd of participants. The cattle classes seemed to be a big hit this year in addition to the regular show classes. My poor little calves didn't know what to think of riders chasing them and throwing ropes at them! Photos have been added to the horse show album.